By Rebecca Nickols on September 5, 2011 Visit Rebecca's Website. Since we built our chicken coop one year ago, I’ve enjoyed sharing the construction and design. I particularly like how the red color stands out and, of course, I love the living roof! But what about the inside of the coop? 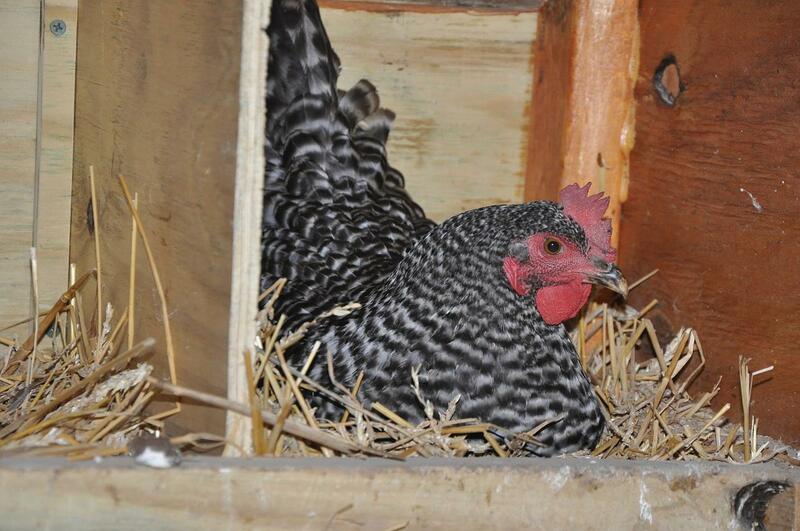 On one side of the coop there are three nesting boxes that are accessible from the outside (to gather eggs). One nesting box per four to five chickens is all that is required. I guess that means that I could have 15 chickens! Actually, with my five birds, I usually find all the eggs in the same nesting box. As for the basic design of the coop, it provides adequate shelter and safety. It’s elevated about 3 feet off the ground which protects the girls from some of the predators of the Ozarks — raccoons, foxes and such. For ventilation, I have five windows that I can open or close, depending on the season or outside temperature. There is about 15 square feet of space inside the coop, and it’s attached by a ramp to an enclosed run. This adds an additional 97 square feet for the girls to scratch and peck. I also keep their food and water in the run and not in the coop. Most sources recommend that the roosting bar needs to allow 12 inches of space per chicken. I have five birds, and my bar only allows for about 8.5 inches per bird. If I had it to do over again I would like for the coop to be a little larger, so that I could add a second bar. I think this would prevent some of the pecking and pushing that I’ve noticed when the girls are settling in for the night. In fact, the coop falls a little short in space in general. 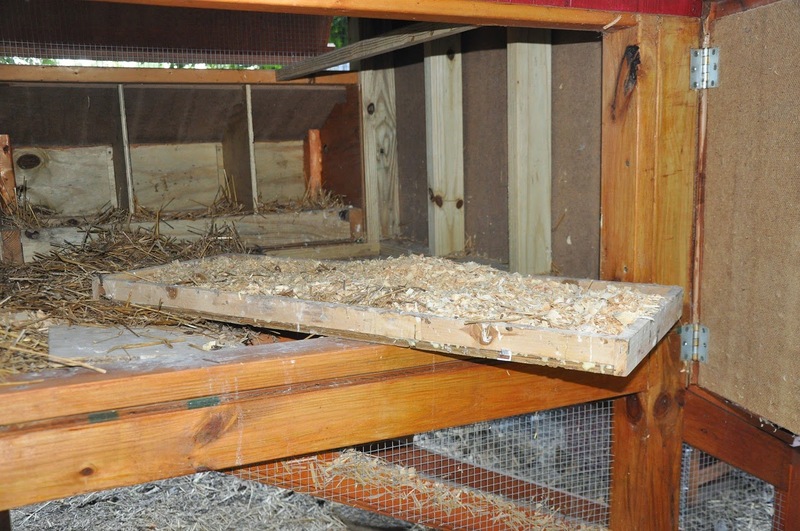 A typical minimal requirement is 3 to 5 square feet per bird inside a coop. I have about 2.8 square feet per bird. The attached run adds more space, and I do open the run and let them free range during the day, but I’m sure the girls would appreciate a little more room to ruffle their feathers! This is especially true during the winter. I’ve noticed that if the temperature is below 20 degrees (or if there is snow on the ground), they prefer to stay inside their crowded-cozy coop. Poop — all chicken keepers have to deal with it. It’s true that it is a great fertilizer, but it’s not a pretty sight. 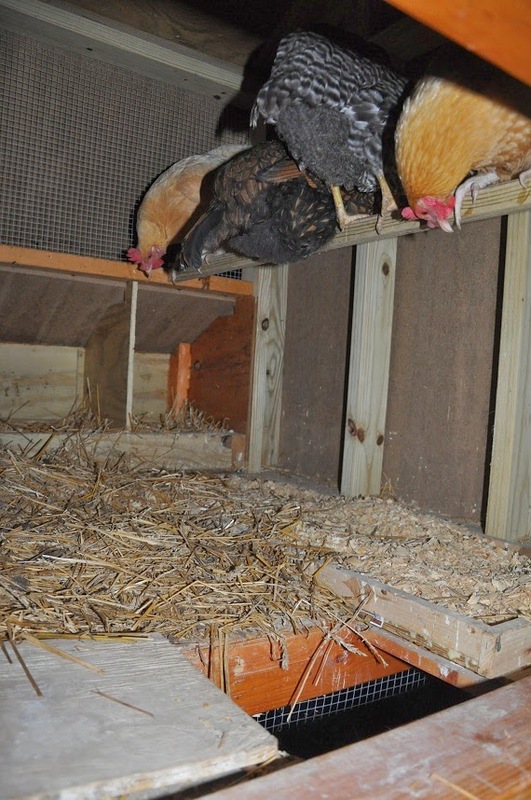 I use either a thick layer of straw or pine shavings as a bedding on the floor of the coop and in the nesting boxes. My husband added a “poop tray” under the roosting bar and that feature has turned cleaning the coop into an easy chore. Once a week I simply take the poop-filled tray and dump it into the compost bin. The chickens typically only “relieve” themselves while they’re roosting, and this strategically placed tray makes this ugly task as pleasant as it can be. That’s the basics of the inside of a chicken coop — it’s pretty simple, but it meets the needs of our five happy, healthy chickens! What unique designs or features do you have inside your coop? I’d love to hear about them! 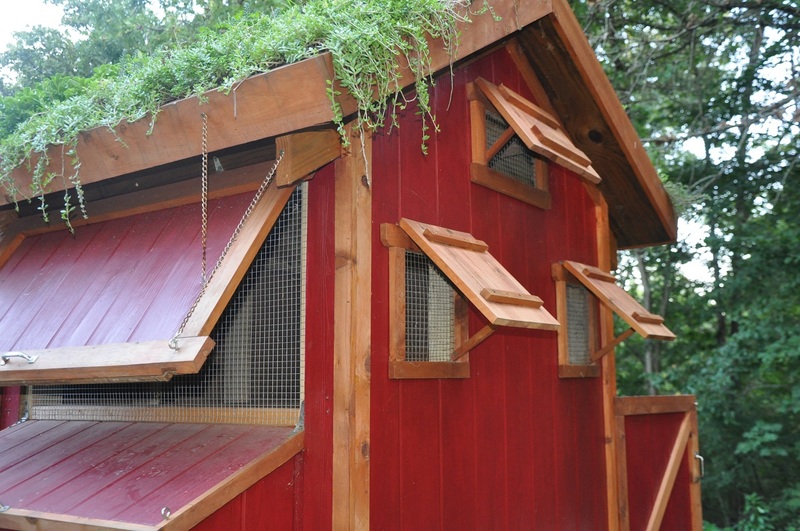 Or share photos of your coop and chickens on our Facebook page. spiningkat–I’ve also heard that cedar shouldn’t be used as a bedding inside the coop, but it sounds as if it’s working well for you.–I’ll have to look into that option also. Virginia and Susan–Sounds like I have more than enough space on my roosting bar and I have noticed them all huddled up together on one end! 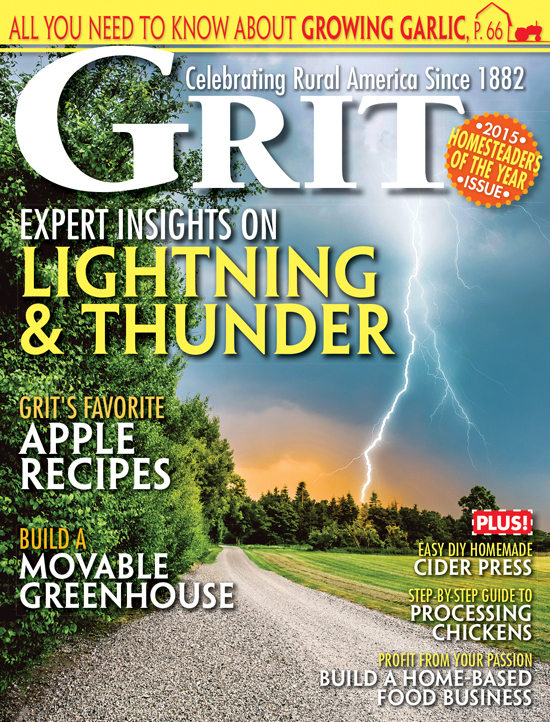 SouthCoast Guy and farmhand2–Both great ideas! The linoleum would be easy to sweep or wipe down and I like the idea of the wire floor under the roosting bar.–They wouldn’t be walking on their droppings and the coop floor would stay cleaner longer. An alternative method of poop collection is to put in a wire floor (like hardware cloth) at least under the roosting poles. Add a bin underneath with doors that open out. Put shavings in the bin. (Cedar may be OK here- but I’ve read that it should not be used inside the coop.) Once you have the desired amount of “litter” in the bin you can add it to the compost pile by opening the doors and shoveling it out. Great post…I am in the middle of my own coop building project! I bought some cheap linoleum to line the floor, which I HOPE will make poop cleaning a bit easier! I have two 4′ long roosts for my 6 chickens and they still all perch on one. Silly girls..they like to huddle, I guess. I have two 4ft long roosting bars for my 5 chickens. I know what the books all say about so much roosting space per chicken, but honestly mine all seem to pile up together at night. And they do a lot of shoving and pecking until they all get settled, so honestly I wouldn’t worry so much about your space. As long as no one is getting run out, they should be fine. Thanks for the article-I love your design-pretty and practical. Your husband should sell the plans. I also have a coop with a yard attached-but sad to say I can’t let them range as the foxes are showing up during the day and my hens stopped going back to their coops-opting for the magnolia tree instead-so they stay in their coops. One thought about the poop. I put about 8-10 inches of cedar chips on the bottom and let them poop on that. They work it in and after about 5-6 months-I shovel it all out to the compost pile and reapply the chips. It does not smell and it even supplies a bit of heat during the coldest winter months as there is some heat put off as it decomposes.